Not in decades has a Turkish politician used such devastating language to denounce another, let alone one from his own party. Turkey’s deputy prime minister Bülent Arınç is the government’s spokesman. That means he can call a press conference with guaranteed television airtime pretty much whenever he likes. So when he appeared before the cameras on Monday evening, his comments were carried live. No-one expected this. Not in decades has a Turkish politician used such devastating language to denounce another, let alone one from his own party. The words created such shock that it’s easy to forget what caused them. Mr Gökçek had used Twitter earlier on Monday to call for Mr Arınç to resign for criticising President Erdoğan’s outspoken interventions in the Kurdish peace process. 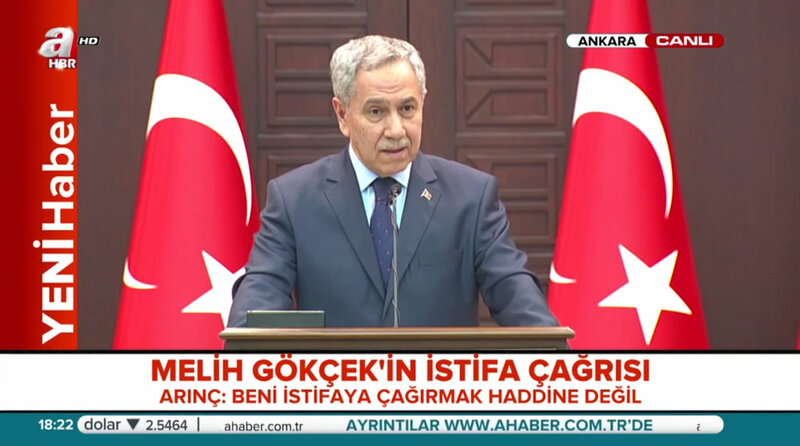 We love our president very much, Mr Arınç had said over the weekend, but it is the government and not the presidency that is running the show. Mr Gökçek cried treason and said the deputy prime minister should be sacked if he does not go voluntarily. For a mere mayor to call for a senior member of his own party’s government to be sacked is astonishing in itself; when the deputy prime minister abruptly struck back with an allegation of corruption, Ankara’s political establishment gasped. Observers and analysts alike are buzzing with speculation of what this very public spat means for Turkish politics and the governing party. There are two points worth making. AK is fighting in a way not seen or tolerated when Mr Erdoğan was at the helm. First, there is little love lost in any part of the Turkish political spectrum for Mr Gökçek. Ankara’s five-term mayor is crude in his manner and shady in his election victories. There is silence in the AK Party ranks tonight in part because most members agree with Mr Arınç’s characterisation of him. Mr Gökçek responded in characteristic fashion on Twitter with a threat to challenge the deputy prime minister in court. The man he narrowly defeated last May, Mansur Yavaş, is watching with interest. Second, there is a far greater reason for the AK Party’s silence tonight: the cracks in their party are more public than they have ever been. The party is fighting amongst itself in a way that was never seen or tolerated when Mr Erdoğan was at the helm. In many ways, this is a good thing. Western political parties must go through a process of self-evaluation and renewal whenever a domineering leader steps off the stage. But Mr Erdoğan doesn’t think he’s left the stage, even though he’s no longer a card-carrying AK Party member and his replacement has been at pains to show he is no puppet. Factions are emerging and members don’t know where to look. That’s a story for a different day. Mr Arınç did not launch a leadership challenge this evening, neither against Mr Erdoğan nor Ahmet Davutoğlu, the prime minister. He did not criticise the government, nor did he hint at any kind of resignation. What he did do was accuse the mayor of Turkey’s capital city of corruption and nepotism. He also said what he truly thinks without waiting to be told. That is a rare quality in any Turkish politician. Request permission to reproduce the superb Turkish political parties chart for my George Washington students. I teach courses on Turkey and its Neighbors every year for my graduating seniors.